The results of the blood test made last weekend is out and there is good news. 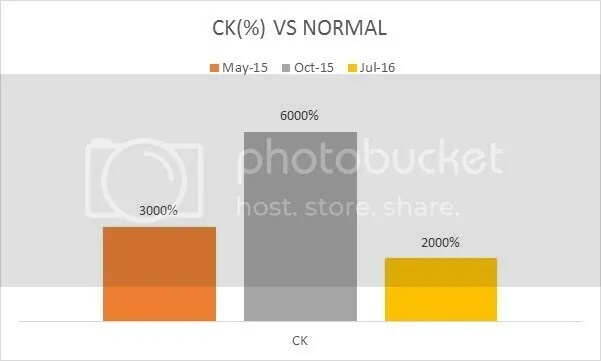 Both CK & CK-MB levels are down compared to the previous results. This third test has the lowest so far. The baseline for the normal values vary from one online source to another but I made the graphs below to illustrate how significant the latest results are. Yes, those are thousand percents versus normal. According to Mayo Clinic, the normal CK level within the age range of Marcus is 150-499. Using the highest limit, Marcus Creatine Kinase (CK) level is just 2000% this time. Relatively high but it’s way better than the result prior to it. CK-MB level follows suit. To explain what CK-MB is I would liken it to a story most of us have probably heard when we were in grade school. Remember The Leak in the Dike? 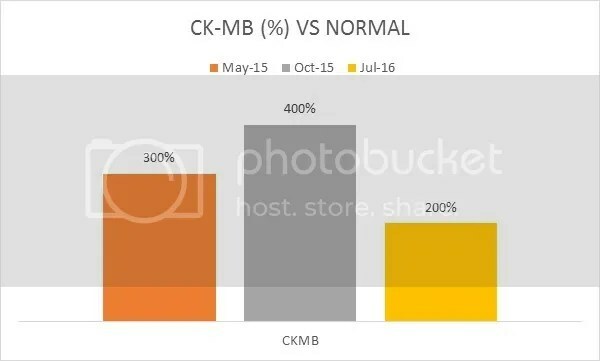 CK-MB is basically a measurement of a leak which means that ideally there shouldn’t be any level of it in the blood result. Normal blood test results should show almost zero. Mayo Clinic says that males would have a reference value of < or =7.7 ng/mL. That’s 7.7 nanograms per milliliter–a lot smaller than a single tear drop. The CK-MB test results we got from Hi-Precision Diagnostic Clinic are in Units/Liter (U/L) and internet sources say it cannot be directly converted to ng/mL unit which means the percentage on my graphs could be off (those are rounded off figures anyway). My wife and I could only assume which factors attributed to the improvement in the blood test. It was after the second test when the doctor prescribed to double the dosage of the Co-Q10. Marcus has been taken 200mg every night since then together with an intake of Alpha-Lipoic. It was also during this time when Marcus began to have frequent sessions with the manghihilot. The skeptic in me couldn’t see that there’s a direct benefit but there’s nothing to lose. And there’s one thing that could highly likely affected the results. The doctor’s advice prior to taking each test was to minimize Marcus’ physical activities and we just realized that sometime in February this year he totally lost his capacity to stand and walk on his own. Since then, he has remained seated either playing games or watching TV. In this case, being immobile was both a bad thing and a good thing. Sigh. We are yet to see the doctor to interpret the results but for now we are thankful that it wasn’t the result that we were expecting. Please continue to keep us in your prayers. Hi-Precision Diagnostics has been accommodating us very well so far. The closest clinic to us now is their branch in Sta. Rosa, Laguna wherein the same professional and friendly personnel took good care of Marcus. Kudos to this company.